When Richard Bellemo started his fledgling landscape and design construction business in 2002, he never expected to be sitting down to lunch with the CEO of Japan’s largest garden supply companies 7 years later. But late in 2009, a group of Takasho Company Ltd representatives set out on a journey to visit some of the most progressive garden landscapes in Australia and one acclaimed RB Landscapes garden was high in their itinerary. 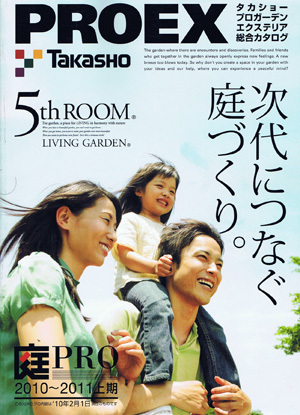 The Takasho Group has forged a strong reputation in Japan for manufacturing and importing unique Japanese styled garden supplies for the flourishing Japanese-courtyard market. A keen garden enthusiast himself, the CEO Nobuo Takakoa makes a yearly pilgrimage to award winning gardens across the globe to feature in the annual Takasho product catalogue. In late 2008, the landscape design community in Australia had turned their attention to one particular garden project in Balwyn, Victoria, that had claimed a number of significant industry titles and drawn national television interest. Awarded for its successful blend of oriental and Australian themes, this RB Landscape masterpiece shot to fame that eventually resonated with overseas garden enthusiasts like Mr Takakoa. Late 2009, Richard Bellemo received a call from the newly formed Takasho Australia representatives outlining their global CEO’s plan to visit Australia and his eagerness to meet Richard at the Knutsford Street property. 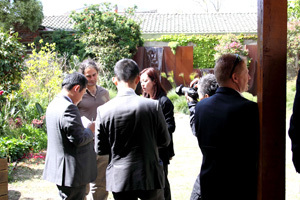 The Australian representatives explained the product catalogue and the plan to feature a number of Australian gardens. 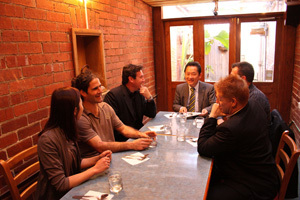 “I was quite surprised when I saw the size of the Takasho entourage when I arrived at Knutsford St, “explained Richard. Expecting only one or two photos of his garden to be used in the Australian Garden Feature of the Takasho catalogue, Richard was shocked to count 21 of the 24 photos in the spread all highlighting his Balwyn creation. “It was great to be able to meet people from a different culture that appreciated garden design as much as we do,” Richard said.